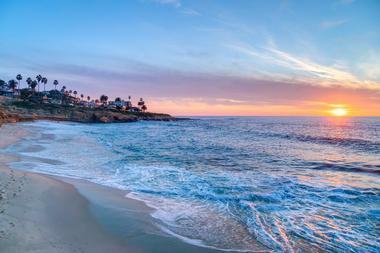 From rocky coasts to beautiful stretches of crisp white sand, San Diego has something to offer for every beach lover. The area boasts a rich history tied into the surfing culture that grew up in the 1960’s and is still growing today. Those wishing to explore the waters of San Diego will find a beautiful variety of fish and sea birds while they snorkel, dive, or take a scenic boat cruise. 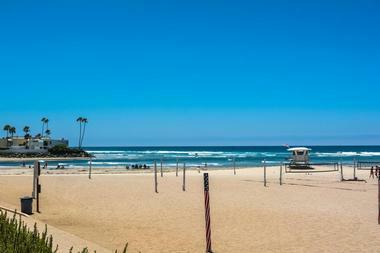 Families and visitors of all ages can find a variety of fun and relaxing activities to do at any number of San Diego beaches. 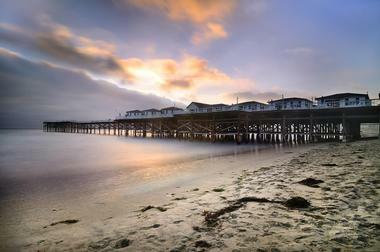 Cardiff-by-the Sea is a small community situated just north of San Diego. The community features 2 miles of walkable beach and 900 acre Elijo lagoon. 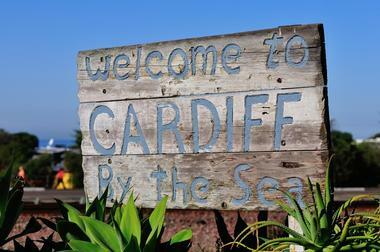 Surfers will love the Cardiff Reef, the area's most popular surf spot. Sightseers can stop along historic Highway 101 and watch the surfers or take in the breathtaking views of the lagoon. The San Elijo Park and Campground offers 171 campsites which include a picnic table and fire ring on each site. Along the beach is an area known as Restaurant Row which offers some of the best cuisine on the west coast and plenty of casual dining opportunities in the town. 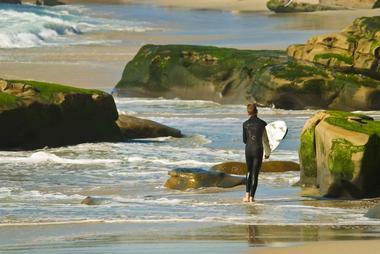 This is one of the best San Diego beaches. Dog loves will want to check out the first leash-free beach in the US located at Ocean Beach. 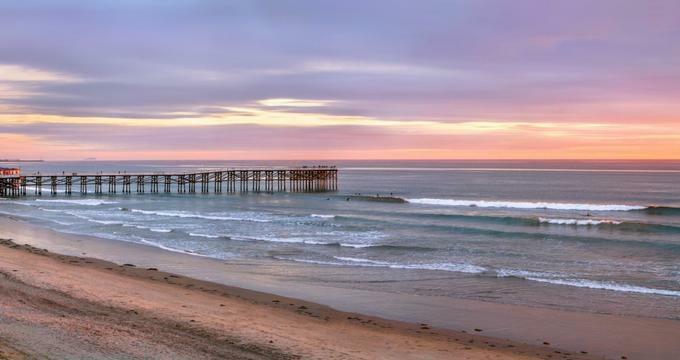 The area is located at the end of the San Diego river and lets beach lovers, pet lovers, and surfers all enjoy the charm of a classic beach town. 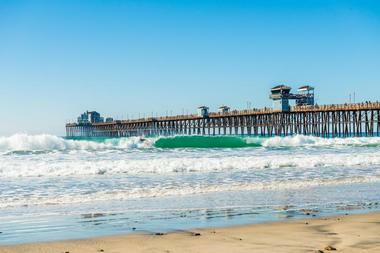 Standing for 50 years the Ocean Beach Pier is one of the most visited Landmarks in San Diego. Just south of the pier is the Sunset Cliffs National Park, a 68 acre park those wanting to enjoy the cliff views or pounding surf. Visitors just wanting a stroll should take in the Ocean Beach self-guided Historic Walking Tour through the areas historic district with buildings dating back to the early 1900's. Located between La Jolla and Mission Beach the Pacific Beach area offers an wonderful nightlife scene for the younger crowd visiting the area. The beach houses numerous bars and restaurants including the popular JRDN Lounge and Raw Bar. The Pacific Beach Ocean Front Walk is filled with those wanting to enjoy a jog, get in some inline skating, or just cruise the numerous shops. Garnet Avenue, the areas spot for trendy boutique shops, also hosts a farmers market on Tuesdays. The numerous beach front hotels and beach houses also attract families who wish to enjoy the sun and sand and maybe even some surfing. 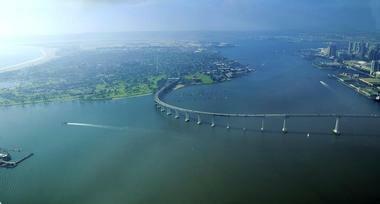 Located on San Diego Bay the Silver Strand Park is one of the cities finest camping and recreation areas. The calm waters make the area perfect for sail boating and swimming if visitors want to avoid the rougher waves of the open ocean. Due to the calm waters the beach is a great spot for shell collectors. Anglers and those wishing to fish off their boats can enjoy a variety of fish from perch to yellow-fin croaker. During summertime there are fire rings available for those visitors wanting to enjoy a cookout. Cars are not allowed on the bay side of the park to keep the beaches clean and protected. 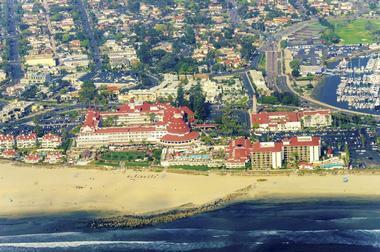 Solana Beach is renowned in the areas for its art and music venues. Families can enjoy waterfront parks and let the little ones splash in tide pools. Couples may wish to take a drip to the local craft brewery or the local winery. While the beach is secluded and more difficult to access visiting Fletcher Cove is well worth it. Visitors can explore the secluded beaches and the numerous caves that have been carved into the cliffs by the ocean waves. The northern area of Seaside, home to the Table Tops, is the perfect surfing spot for those wanting larger waves. Those wishing to enjoy shopping and good food should visit the Cedros Design District which is home to 85 unique boutiques and restaurants. 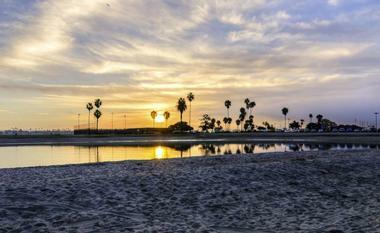 Located just five miles north west of Tijuana Mexico is Imperial Beach, the southernmost beach in California. The beach is home to more than 300 species of bird making it one of the most popular bird watching areas in southern Cali. For the last thirty one years the beach has been home to the US Open Sand Castle Building Contest. The pier at Imperial Beach is one of the area's most popular fishing spots and offers beautiful views of the Los Coronados islands. The area is very popular with surfers and is also home to the Surfboard Museum along with numerous surfboard shapers and designers. Visitors wanting to enjoy the sound of crashing waves and won't miss soft sand will enjoy Windsnsea Beach. Due to the rocky cliffs and rough surf the area the area is more popular with experienced surfers and swimmer and divers are cautioned to be wary of the heavy shore-break. The cliffs offer wonderful views for those taking a stroll in the area and couples wanting a romantic backdrop for photos. The Windansea Surf Shack is a handmade palm covered structure that is now a protected historical landmark thanks to its connection to the local surfing history.